This picture was taken approx. 1982, just after my Granny had her stroke, I think it was taken in Lanarkshire somewhere on a day trip, I remember there were a whole series of pictures. 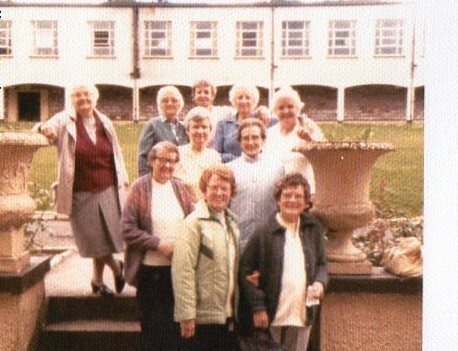 Front row left to right, Mrs Meg (Lawler)Muirhead and Mrs Meg (New) Welsh (my Granny) 2nd Row - Mrs Nan (O'Hagan)Walker,Mrs Jenny (Beck)McFayden, Mrs Gertie Lynch, Mrs Molly (Flynn) Corrigan, don't know the next three ladies names, Mrs Bella (Corrigan) Cameron.